Thanks to Taylor Kennedy for the following detailed example of how to trace your Scottish ancestors in Canada. difficult but once I saw a pattern on naming places and referring to a Parish map it became very easy. negotiation with the General Register Office for Scotland. Permission from them has not, as yet, been forthcoming. the Scottish Census records to ensure you have access to all key areas of information contained within this collection." James Gray November 17, 1850 in Airth, Stirlingshire. boys and two girls. Living on Carron Street. The next two children born were Richard in 1861 and Thomas in 1864. 1891 and had one more member added to the family, who was Mary in 1892. The first born, James Gray who was born in 1880, must have died before the 1891 census as he is not listed with the family. Swansea. 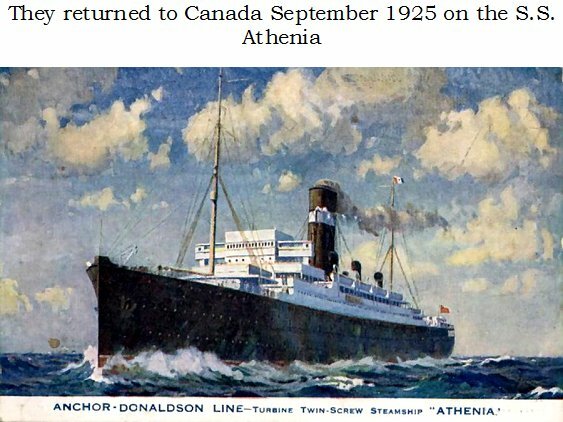 On the ship docket, Richard Jr. occupation was classed as a Mason and upon arriving in Toronto became a Motorman. 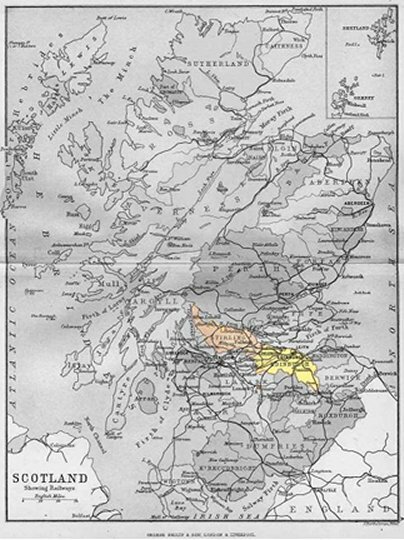 house, born May 1885, all from Edinburgh, Scotland. This census was taken in April of 1911, one month after Mary died. The address is listed as Lot 38 and son Richard Gray and Mary Ann Dearden are living on Lot 39, in Swansea, York South. Scotland June 24, 1881 who enlisted in WWI and next to kin was his wife Mrs. George Gray of 93 Tecumseh Street, Toronto. the son of Richard Gray and Jane Allen. 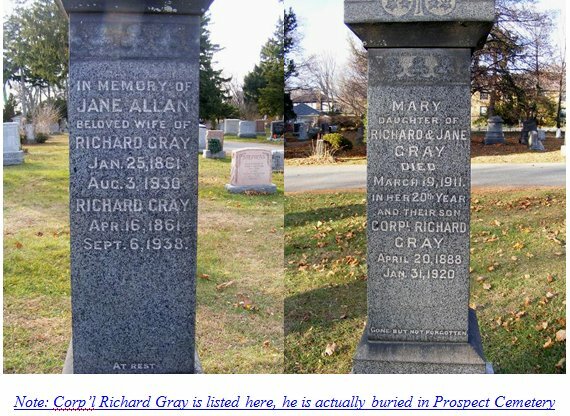 of kin was his wife, Mary Gray, residing at 122 West Lodge in Toronto. Richard was 27 years old, stood 5' 7 ½"
with an expanded chest of 37", the range being 4" from rest. His complexion was dark, eyes brown and hair was Auburn. 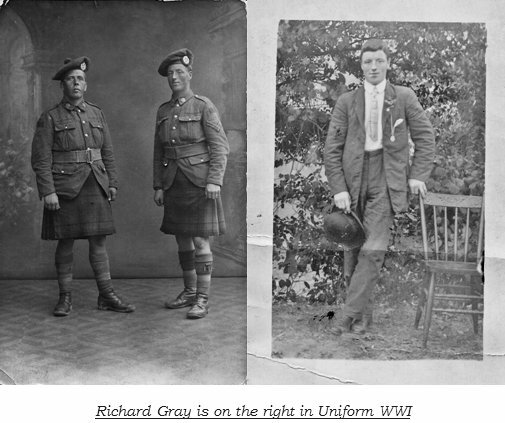 Richard Gray is on the right in Uniform, WWI. day from his injuries. Age was 32 years old. Ironically he went through the war without a scratch. His profession was Motorman and worked for the Toronto Street Railway company. 255 Avenue Road. The Undertaker was W.H Bickley of 913 Yonge Street. From the Ontario Archives : Newspaper archives for the Toronto World N96, from the front page of February 02, 1920, Monday morning news. Sub heading - - George (Richard) Gray, Driver of Car Which Jumped Tracks, Passes Away!!!! the Queen car, was cut about the face with glass and about 25 other passengers were shaken up. probably prevented her from being more seriously injured. Grays body was removed to the morgue, and an inquest will be opened this evening. Please note the paper called him George but his name was Richard and I inserted it above. in Section 7, Plot # 649. George through the Veterans Association so we can conclude he was a returned soldier. same age and daughter Joan, the dressmaker was 39 years old and single. Their abode was listed as 84 Runnymede Street in Swansea. They obtained their passports from Ottawa on May 18, 1925. Richard was #88437, Jane was #88085 and Joan was #86354. 9 days old when she passed. She was sick from July 26th with Hemplyra for 7 days and Cardio Syncope 2 days. Residence was listed as 82 Runnymede Road, Swansea and was at the residence for 20 years and in Canada for 25 years. 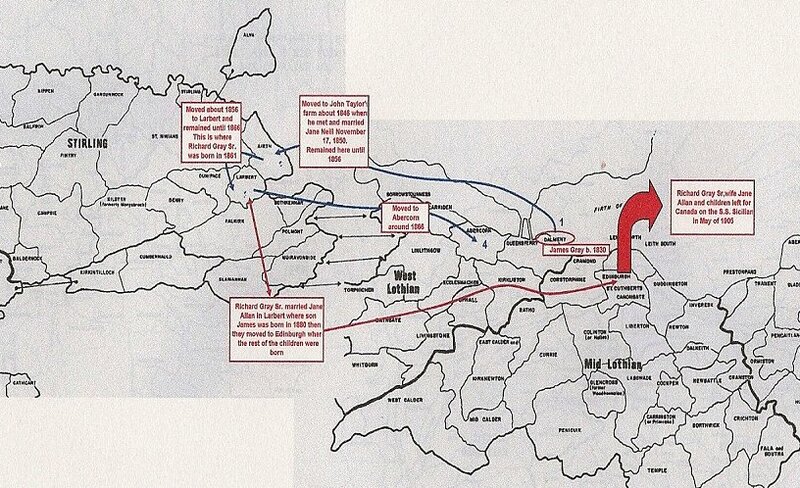 The maps are good and you can follow the family through the census, where they were born, to final spot in the 1901 census. 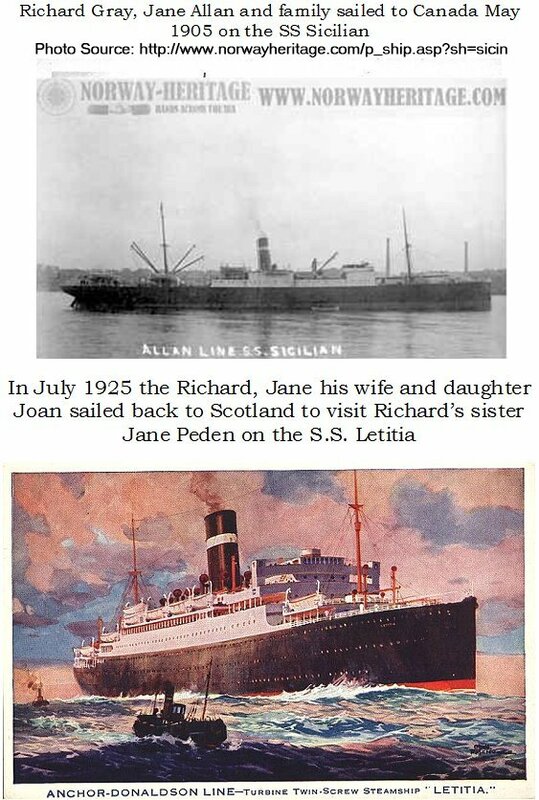 We have replaced the previous photo of the SS Sicilian which was shown below, with a correct picture of the Sicilia, c. 1905. The one in your picture was built about 1948.
wasn’t made public until about 1917. Most obvious differences are Allan’s Sicilian had a quite low bridgework and a  near vertical bow. Parisian, Austrian, Manitoban, Brazilian, Polynesian, etc. Thanks to this researcher from the U.K. who wishes to remain anonymous. Source for international Steamship Pictures is http://www.photoship.co.uk/Browse%20Ship%20Galleries/.